The DreamLine Cornerview sliding shower enclosure provides a modern solution to maximize space with a corner installation and center opening design. The Cornerview has a straight edged style that provides a comfortable showering space. The Cornerview can fit into virtually any corner, making it perfect for smaller bathrooms. Instantly upgrade the look and feel of your bath space with the Cornerview sliding shower enclosure. Shower Base has a glossy acrylic finish that is scratch, slip, and stain resistant for safe showering, and is reinforced with fiberglass for durability. Drain opening fits any standard 2 in. compression fitted drain (not included). Direct to stud installation; Professional installation is recommended. The DreamLine Prime sliding shower enclosure and base kit adds style and bold design to your shower space. The neo round sliding style of the Prime enclosure can fit into virtually any corner, making it perfect for smaller to midsize bathrooms, where space is limited. The Prime enclosure and SlimLine shower base kit provides the ultimate solution to your shower project! Prime 33-inch x 33-inch x 74.75-inch Framed Sliding Shower Enclosure in Chrome with Quarter Round Shower Base The DreamLine Prime sliding shower enclosure and base kit adds style and bold design to your shower space. 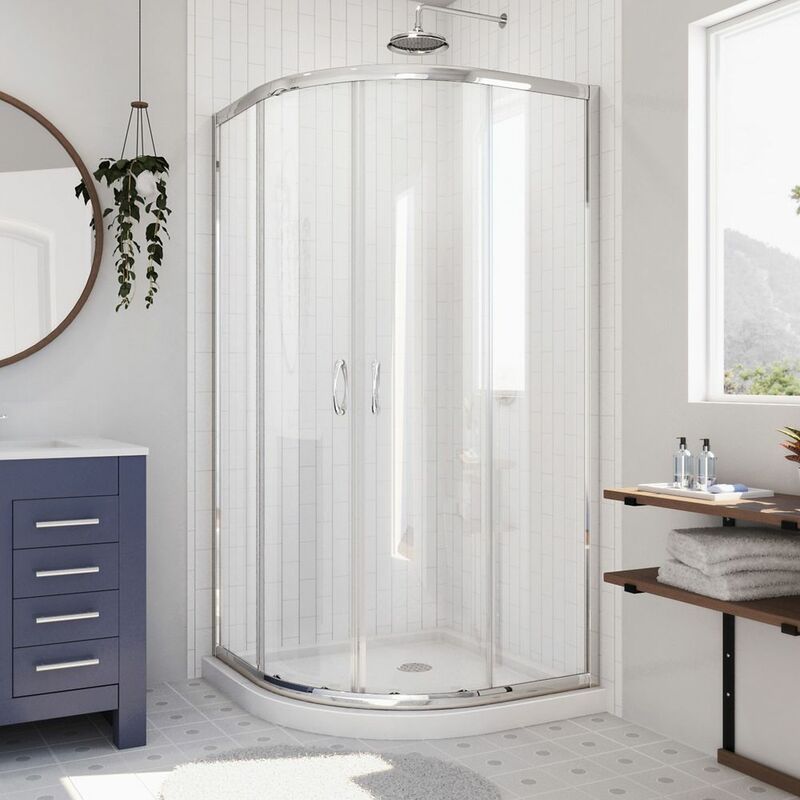 The neo round sliding style of the Prime enclosure can fit into virtually any corner, making it perfect for smaller to midsize bathrooms, where space is limited. The Prime enclosure and SlimLine shower base kit provides the ultimate solution to your shower project! SlimLine Shower Base: Curved neo round design for corner installation; Slip-resistant textured floor; Reinforced with fiberglass; cUPC certified. Drain opening fits any standard 2 in. compression fitted drains; Direct to stud installation; Drain not included; Plumbing codes vary by state; DreamLine is not responsible for code compliance. Shower Enclosure and SlimLine Base: Limited Lifetime Warranty. Prime 33-inch x 33-inch x 74.75-inch Framed Sliding Shower Enclosure in Chrome with Quarter Round Shower Base is rated 4.6 out of 5 by 36. Rated 4 out of 5 by Shale from I love this shower. It was actually smaller than I expected. However, this was installed in my be... I love this shower. It was actually smaller than I expected. However, this was installed in my bedroom bathroom and it’s literally “MY OWN BATHROOM” (no kids or husbands allowed!) so it works for me! Rated 5 out of 5 by Matt from Great Quality Product! Would install this again. I’m 5-10/260 and... Great Quality Product! Would install this again. I’m 5-10/260 and I would shower in it! Lots of room. Rated 5 out of 5 by MaryK from Outstanding product! Purchased for a total redo of a 70 yr old extremely small master bath. Purchased base and doors. My tile guy installed, plus tile walls. He was impressed with the quality. Glass doors very sturdy, tracks work well, and magnetic door edges ensure that water will not seep through during shower. Doors so heavy that two strong men struggled to get the box in the house. Was apprehensive about what seemed to be a plastic base, but concerns were unfounded. Base is very well made and stable by itself, and would have been fine, but my tile guy laid a cement base and embedded the shower base, to provide added stability. The curved sliding doors make it possible to have a much larger shower, as my previous shower's swing-out door took up space in this very tiny master bath. Couldn't be happier. Every piece, including doors and base were extremely well packed with great care. Had a few questions prior to purchase, and the person I spoke with pushed me over the edge to purchase with her outstanding knowledge and attitude. She was extremely knowledgeable and helpful, both on the phone and with the info she emailed me. I highly recommend this product and this company. Rated 5 out of 5 by Nonnie3X from This shower looks even better than the picture! I... This shower looks even better than the picture! I am thrilled with it! Rated 5 out of 5 by Carlos O from Great feaures. My wife and me are so happy whit that kit, easy installation, nice design and fit perfect in our small bathroom. Rated 5 out of 5 by R Lewis from Impressive service We've had this shower for over 4 years now, and it's wonderful. It's sleek, fits our tiny bathroom, and is easy to clean. But the main reason I'm writing this review now is because of the wonderful service we received from DreamLine. One of the track wheels was broken by our 4-year-old, and DreamLine rushed a replacement set to us in just a few days. We are so grateful that the company stands behind their product, even when the damage is caused by "user error"! Thank you. The difference in these kits is the color of the base. Please speak with your local Home Depot regarding the pricing discrepancy. If you have any other questions, please contact the DreamLine Customer Support Team at 866.731.2244. We are available 8am-7pm EST, Monday through Friday, and Saturdays from 9am to 5pm EST and will be happy to answer any questions you may have. You may also send an email to support@dreamline.com. Thank you for considering DreamLine! Hi. how can I obtain more decorative plastic cap assemblies for the screws. We invite you to contact our DreamLine Customer Support Team at 866-731-2244 to discuss this further. We can also be reached by sending an email to support@dreamline.com. Our hours of operation are 8am-7pm EST, Monday through Friday and Saturday from 9am-5pm EST. Thank you for choosing DreamLine! We look forward to helping you soon!